We deliver bespoke software solutions to help drive business transformation and differentiate you from your competitors. Using our enterprise delivery platform and proven hybrid delivery methodology we are confident we can deliver the quality you need, on time and on budget. 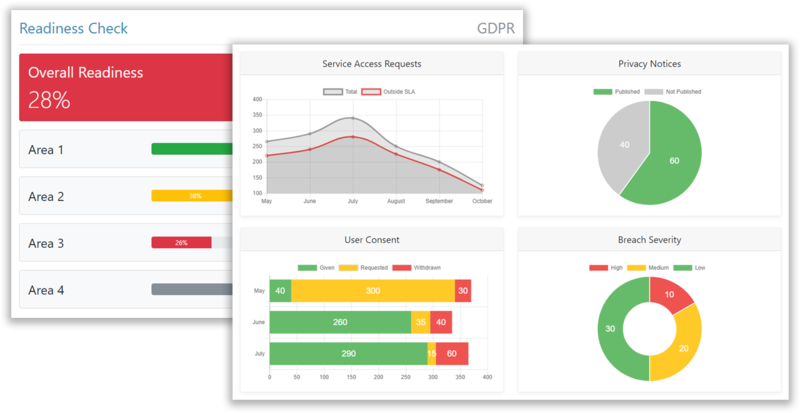 We have built our GDPR platform to help organisations understand and manage their GDPR compliance obligations. Our certified GDPR staff have used their expertise to not only deliver adherence to the strict GDPR rules but also present it in a clear and easy to use interface. What makes our platform special? Our core transactional patterns are used as the foundation for all our software solutions. The platform is built according to this set of enterprise architectural principles that incorporate industry best practices. This saves many hours in the design phase of a project, which ensures the base of your application is reliable and secure. Our platform is constructed using a number of architectural components to significantly reduce the software delivery timeline. Used in the early phases of a delivery to develop functional prototypes that allow business users to visualise user journeys. A reusable library of presentation components that follow user interface and user experience models, allowing seamless navigation and presentation across all devices - from desktop to mobile. Built from the ground up using Selenium Web Driver our automated regression testing saves thousands of hours and uses an architectural pattern to promote easy maintenance. Using our platform, we've made it easier and cheaper for you to meet the General Data Protection Regulation requirements. Create and publish Privacy Notices, manage Service Access Requests and much more. We'd love to talk. Get in touch.